We love our pets but we hate the messes they leave on our carpet. But it’s OK! Don’t worry! We offer pet urine odor removal for carpet stains. Pet urine stains on carpet require professional attention and lead to permanent damage if ignored. Call Champion Chem-Dry ASAP. Champion Chem-Dry pet urine odor removal is veterinarian-approved, non-toxic and innovative and effective. Learn why it’s so important to trust the professionals and to remove pet urine from carpet. Pet urine contains ammonia, hormones, uric acid and bacteria. The urine itself is extremely potent and harmful to carpet. The ammonia breaks down over time and transforms into sulfuric chemicals. The sulfuric chemicals produce the smell associated with pet urine odors. The smell is similar to the smell of a skunk in the wilderness. The problem with pet urine stains is that the urine will permeate carpet fibers and crystalize. The urine odor is pungent and encourages your pet to continue to pee there until the odor is gone, which compounds the problem. Besides the unpleasant smell, this is just another reason why pet urine odor must be eliminated ASAP. If your pet continues to pee in the same area, the urine will continue to crystalize and become corrosive. If left unattended to, urine can corrode carpet fibers, pads, floorboards and even surrounding walls. This means that pet urine is a serious stain that requires a serious solution. That’s where Champion Chem-Dry and P.U.R.T. come in. P.U.R.T. is the strongest, most-effective pet urine removal treatment available and is designed to destroy urine odor and stains. P.U.R.T. permeates deep into the carpet fibers to eliminate urine at molecular level. Our process starts with a UV light inspection to identify pet urine invisible in plain sight. 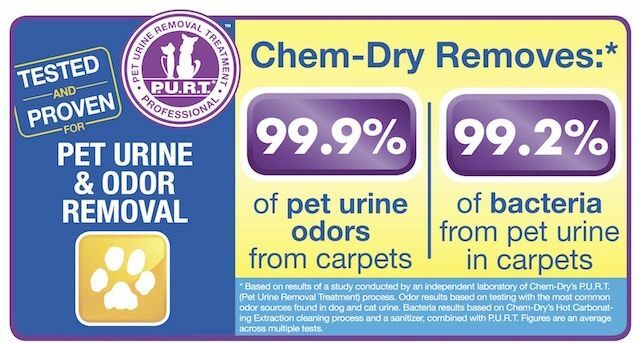 The goal is 100% removal of all pet urine and odors. The inspection provides a target for our technician. He then uses our Hot Carbonated Extraction (HCE) equipment to rinse and remove surface level dirt and toxins to allow easy access to the embedded pet urine. Once HCE is complete, P.U.R.T. is applied and reaches deep into the pad, fibers and sub floor to annihilate urine and its odor. On average, it requires between 24-36 hours for P.U.R.T. to take complete effect and remove all odors. We’re proud to say that P.U.R.T. is safe for pets and approved by veterinarians. Industry-recognized carpet cleaning process removes embedded dirt, germs and toxins. Our upholstery cleaning service in Tampa uses low-moisture methods for clean furniture. Professional cleaning service for all types of rugs, including area rugs and fine Oriental rugs. Superior tile cleaning process, for stone and grout too, removes harmful bacteria and dirt. Reliable commercial carpet cleaning offering flexible scheduling to suit your business needs. Expert carpet stain removal solutions and techniques to properly remove damaging spills. Cleaning, polishing and sealing service for granite countertops restores original beauty. Our Facebook Page: “Like” us for cleaning guides, décor trends and tips and recipes! Tell us about your experience with us? We love to hear from customers! Please fill out a review here.